The changing seasons have more of an effect on your energy needs than on the solar panels addressing them. While it’s reasonable to predict a lower efficiency rate from solar panels in the winter, it’s really the sun itself—and less so the weather conditions on the ground—governing how well solar paneling powers your home and helps you save on your utility bills. A cloudy day is likely to have a bigger impact on your solar panels’ photovoltaic cells than subzero temperatures, and still neither condition completely deteriorates the effectiveness of your solar panel systems. A local and experienced contractor will know the region’s seasons as well as how they specifically affect the local weather, the incoming sunlight, and what that means to your home. 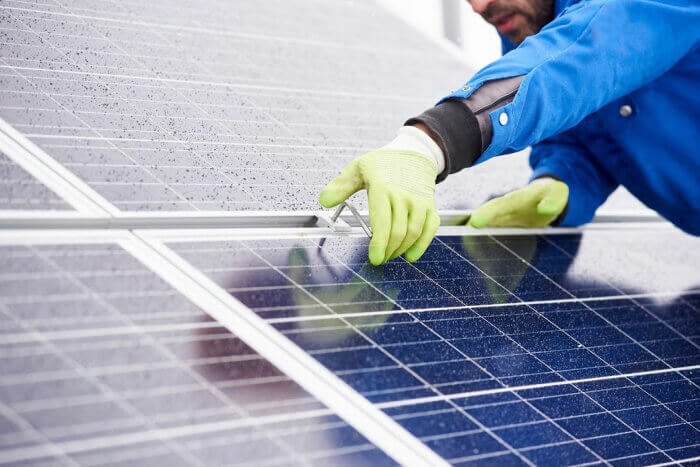 A reliable contractor will visit your house and assess its strong points—as well as its weak points—to give you the best roadmap toward outfitting your property with solar panels for your home. At Modernize, we frequently speak to homeowners about their home improvement projects. In our recent interviews, 90 percent of homeowners requested a checklist to help them find and vet contractors. Modernize now offers homeowners a free, digital Contractor Checklist as a simple, step-by-step guide to assist with your solar panel project. 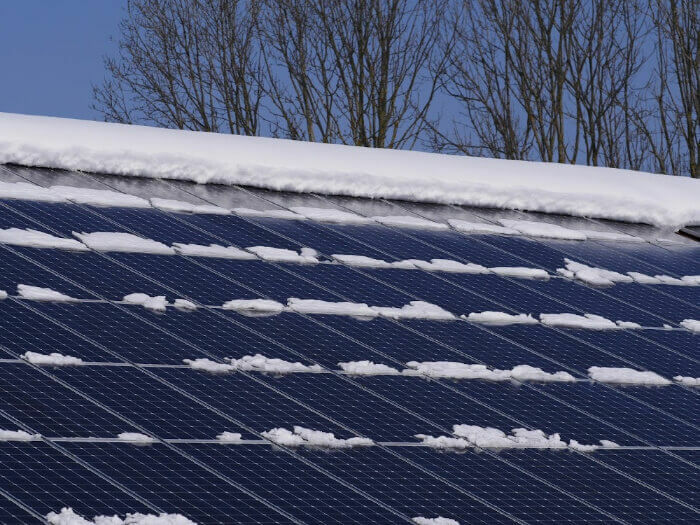 Solar Panels in Snow: How Many Solar Panels Do I Need? One of the top reasons most home improvement projects, including solar panel installation, are started and completed during the spring or fall seasons is the steadily rising utility bill. Homeowners watch those numbers climb and are in turn spurred into action. In California, for example, electricity usage is about 50 percent higher in the summer than in the winter, according to the LA Times. That increased demand means some expensive months for homeowners still relying completely on the electric grid for air conditioning, among other uses. And take early 2019’s extreme weather conditions as another example: The deep cold in the Midwest crippled utility companies so much so that some governments urged consumers to lower their thermostats, as did utility companies themselves. Surely, this experience had some homeowners researching solar paneling for homes. And if it didn’t, it should have. True: Less sun time means less solar energy, but your home doesn’t need as much energy in the winter, either. During extreme conditions, the sun can still shine and still power solar panels. Take it from Solar Energy Technologies Office Director Charlie Gay, who stated in a Department of Energy blog that solar panel systems “actually produce useful power throughout all four seasons.” In fact, he noted, the DOE’s Regional Test Centers—in Colorado, New Mexico, Nevada, Florida, and Vermont—assess specific weather-related challenges for solar paneling. “Researchers at the test centers have shown that solar can still successfully generate electricity in snowy areas and other harsh environments,” Gay wrote. Additionally, according to the New York Times, “snow typically melts right off the panels, especially if the panels are tilted.” That’s not to say heavy snow is negligible, but it’s certainly manageable. A trustworthy solar paneling installer should be able to explain to you how the climate in your region—and various weather conditions—will affect your solar panels in winter, in summer, spring and fall. Contractors are also skilled at making sure your home remains comfortable throughout the installation, an especially pertinent need during both colder and hotter months. Rodney Westlake and his daughter climb mountains, In 2017, the duo got stuck while climbing the Alaskan Denali—or McKinley—Mountain, the highest peak in North America. “Up there it was definitely this cold,” Westlake told the Tribune, adding that he and his daughter found refuge in tents that captured “solar energy like a greenhouse,” the article reads. “It’s not so bad as long as you have the right gear,” Westlake summarized. Snow, extreme cold, bad weather conditions—none of this stopped solar panels from heating and enlivening the Westlakes. The solar panel systems that you’re installing through a certified and professional contractor will of course yield much larger results and be able to sustain immeasurably heavier winter climate conditions. When in doubt, consult your contractor on the challenges your house might encounter and how to approach. In many cases, Westlake has it just right: Having the right gear makes all the difference, and your local contractor knows what is right for your home and solar panels in winter. A home improvement project during the high season will likely impact your estimate and project timeline. During warmer months, contractors and supplies are in high demand— you’re not the only one noticing a high electric bill. Contractors are less likely to offer discounts during peak times. To save money on solar panels for your home, consider scheduling your project during the cooler months. Your long-term savings will remain similar, but incentives and seasonal promotions are never a guarantee, and likewise never guaranteed to last. For example, the Residential Renewable Energy Tax Credit, which applies to up to 30 percent of your installation (that’s hard and soft costs combined), is phasing out its value over the next several years. By 2022, that 30-percent figure drops to 10 percent, according to the Solar Energy Industries Association. Additionally, homeowners could be subject to state requirements making solar energy a mandatory source of power for new houses—for now, though, only Californians have to worry about that. On Dec. 2018, California lawmakers voted “to require homes built in 2020 and later be solar-powered,” according to the LA Times. That law doesn’t concern itself with what month homeowners install their solar paneling in because it doesn’t matter—savings are year-round, year-long, and annually significant. With an uncertain future of incentives and a present reality of high competition and ample rebates, the best season to install solar panels is now—no matter when you read this. Since solar panels completely covered in snow would have a difficult time accessing sunlight, most are designed, constructed, and installed in such a way to avoid ever being completely submerged. A trustworthy contractor will identify the most efficient tilt, positioning, location, and height of your solar panel system to guarantee their maximum output and subsequently the highest possible savings on your utility bill. Before determining what kind of and how many solar panels you want, it’s good to understand the type and amount of solar energy present at your location. Various public resources are at your disposal to do just that. The National Renewable Energy Laboratory, for example, created a map showing the concentration of sunlight radiation across southwestern states like California, Nevada, Arizona, New Mexico, Utah, and Colorado. How red is your region? Another more specific example comes from a UC-Berkely National Laboratory team. On an annual basis, the researchers determined, panels were only affected with a 20-percent decrease at peak shade. Want to know more about your own location and its irradiance properties? Use the Department of Energy’s calculator tool, which asks you for your address and spits out the solar energy you can expect. A local contractor will be able to explain what you should expect in terms of energy and how you can expect it to increase the value of your home, not to mention what kind of panels you will benefit the most from, and where they should get installed.